We have to make a lot of important choices as parents and one of the decisions I am happiest with is making my own baby food. With all of the challenges I face when it comes to time management, making my own food seemed like it might be another stressful and time consuming chore, but with the Baby Bullet system I am able to make quick, quality food for my son for the entire week in just an hour or so (including cooking time)! The Baby Bullet system is BPA free and includes all the tools you need to blend and safely store meals for your baby. The Batchbowl is perfect for pureeing large batches of food and is dishwasher safe (top rack only). The short cup is very handy for smaller jobs. For example, I love using it to quickly blend single servings of fruit for my son, such as a banana for his morning cereal. The Baby Bullet comes with two blades: The Baby Blend Blade is for puréeing and blending foods. The Milling Blade is for milling grains to make cereals. Both blades are BPA-free and dishwasher-safe. It is so easy to load the Batchbowl with cooked veggies or fruits, place it on the Power Base, push down, twist and within seconds you have perfectly blended baby food. Just make sure the blade is twisted on snugly to prevent any leakage. It is important to properly clean your bullet base when food leaks into it to ensure that it continues to function with the ease you expect from it. Full cleaning instructions are provided in the user manual. I especially love the storage units for the Baby Bullet. The batch tray is made of BPA free silicone and holds 6 servings of food. I love the lid which snaps on snugly to keep your food protected in the freezer. It is also a breeze to pop the food out of the compartments. I also love the storage cups with the date dial lids. They fit easily in the storage tray that is included to keep them from tipping over in your refrigerator or freezer. The date dial makes it easy to keep track of when you made the food allowing you to maintain optimal freshness. The soft tip spatula is crucial for transferring the food into the storage containers. It really gets in between the blades to allow you to fully remove all the food you have made. 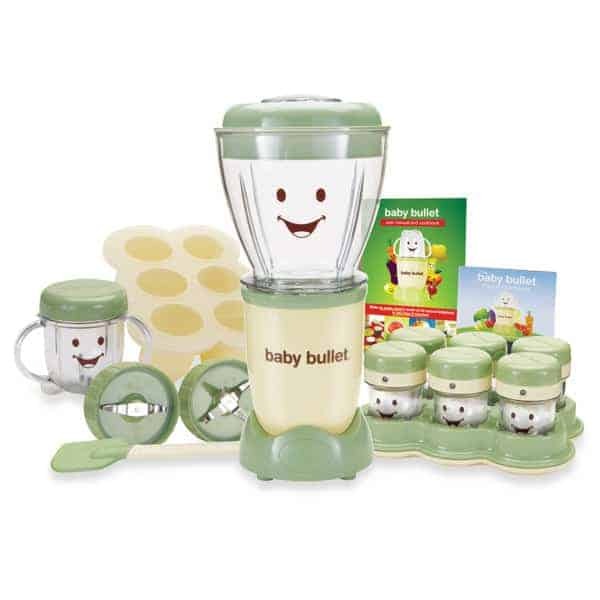 The Baby Bullet consistently produces a smooth puree with any vegetable or fruit you desire. As your baby masters different stages of eating it allows you to create food with more texture. The Pocket Nutritionist and User Manual and Recipe book provide invaluable guidelines and advice for parents. At a quick glance, I was able to determine which foods were the most important to buy organic, as well as which foods should be avoided during the first year. The recipes provided are quick, simple and take you through different stages of your baby’s eating. I literally don’t know what I would do without my Baby Bullet. It is essential for any parents who want to make baby food quickly and safely at home. This product helps me maximize my time and my money, while providing the freshest and healthiest food for my son. I learned that the storage cups have a date dial system. How cool! It comes with a blade for grains such as rice, millet, and oatmeal. Storge cups date dial system. Very handy. I love the protectant lids that keep the food safe and spill proof. I love all the recipes on the site! I learned that it’s easier than I thought to make fresh baby food, and love the recipes. I learned some tips for g reat recipes! I learned that I can get recipes from their site! I’m really crossing my fingers for this! I like that it’s BPA free! I learned some new recipes like Strawberry and Pear Totsicles. I like the black bean and veggie soup recipe on the baby bullet recipe page. I like the date dial system on the storage cups. Yes, all of the Baby Bullet blades, Batchbowl, cups, bowls, lids and storage containers are dishwasher safe. I learned it has date dial storage cups for easy and safe food storage. There are a few foods that babies can eat raw (i.e. bananas and avocados). Most foods need to be steamed or boiled before they are pureed. The Baby Bullet User Manual and Cookbook includes detailed instructions to help you make the perfect puree every time. they have a turbo steamer! YAY! I learned that the little food cups have a date dial on them. I learned that the cups have the date dial system. How neat! Thanks for the opportunity to win. I like the green in the snap tops which are hard to confuse with other lids. This Baby Bullet Food System looks quite handy for making and storing baby food. I learned if you order now you get the steamer free. The cups actually have little faces on it! Cute! I learned that they have recipes on their site to make it easier to make baby food. The Date Dial looks so neat! No labeling to deal with. I learned that they have an online Recipe section. I learned that you can create and store a week’s worth of baby food in less than 5 minutes. Thanks for hosting such a great giveaway! I’ve posted some basic recipes using the Baby Bullet Food Steamer here: http://babybulletguide.com/?p=66.